From top, left to right: The Manila Bay area skyline, Rizal Monument, Gate of Fort Santiago, Malacañang Palace, Manila City Hall, Quiapo Church, and the San Lazaro Tourism and Business Park. Manila (Philippine English: ; Filipino: Maynilà) is the capital city of the Philippines. It is one of the sixteen cities which, along with the municipality of Pateros, make up Metro Manila, the National Capital Region, that has an overall population of around 12 million. In addition, its total urban area, referring to its continuous urban expansion into the provinces of Bulacan, Cavite, Laguna, Rizal and Batangas has a population of 7007241230000000000♠24,123,000. The city of Manila is located on the eastern shore of Manila Bay and is bordered by the cities of Navotas and Caloocan to the north; Quezon City and San Juan to the northeast; Mandaluyong to the east; Makati to the southeast, and Pasay to the south. It has a total population of 1,652,171 making it the second most populous city in the Philippines, behind Quezon City. The populace inhabit a land area of only 2,498 hectares, making Manila arguably the most densely populated city in the world. Manila (and more broadly speaking, Metro Manila) is the economic and political capital of the Philippines, home to extensive commerce and some of the most historically and culturally significant landmarks in the country, as well as the seat of the executive and judicial branches of the government. 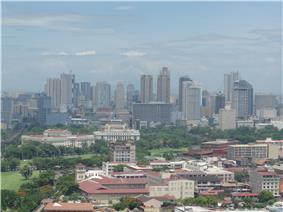 Manila was listed as a global city by the Globalization and World Cities Research Network in 2012. The Manila Galleon trade-route (c. 1565 to 1815), being the first instance in human-history wherein world-trade truly became global (previous world-trade routes had not yet crossed the Pacific and had not reached a global nature), made Manila a primordial foundation-stone of true globalization. Manila is the host to the Embassy of the United States in the Philippines and the Apostolic Nunciature to the Philippines. Manila has many scientific and educational institutions, numerous sport facilities, and other culturally and historically significant venues. The city is politically divided into six legislative districts and geographically into: Binondo, Ermita, Intramuros, Malate, Paco, Pandacan, Port Area, Quiapo, Sampaloc, San Andres, San Miguel, San Nicolas, Santa Ana, Santa Cruz, Santa Mesa and Tondo. These districts were towns and parishes absorbed by Manila during the 19th Century. The earliest written account of the city is the 10th-century Laguna Copperplate Inscription which describes a Malay kingdom in what is now Manila maintaining diplomatic relations with the Indianized Kingdom of Medang in modern-day Java. The city had preferential trade with Ming Dynasty China, which registered the place as "東都" (Dongdu). It then became a province of the Maharajanate of Majapahit and was called by its Sanskrit title, "षेलुरोन्ग्" (Selurong) before it was invaded by Brunei's Sultan Bolkiah and renamed "كوتا سلودونڠ" (Kota Saludong) or simply Maynilà, from the word "Maynilad", a native Tagalog term indicating the presence of Nila, a flowering mangrove plant once abundant in the area. Manila eventually became the center of Spanish activity in the Far East and one end of the Manila-Acapulco Galleon trade route linking Latin America and Asia. The city would eventually be given the moniker of the "Pearl of the Orient", as a result of its central location in the vital Pacific sea trade routes. Several Chinese insurrections, local revolts, a British Occupation and a Sepoy mutiny also occurred shortly thereafter. Manila also saw the rise of the Philippine Revolution which was followed by the arrival of the Americans who made contributions to the city's urban planning and development only to have most of those improvements lost in the devastation of World War II. Since then the city has been rebuilt and has rapidly grown. 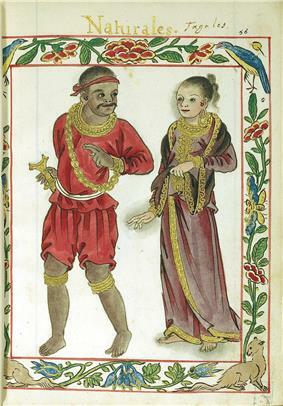 A page from the 16th century Boxer Codex showing a Tagalog couple of the Maginoo caste. The earliest evidence of human life in and around the area of Manila is the nearby Angono Petroglyphs dated to around 3000 BC. Furthermore, negritos, a class of Australoid peoples, became the aboriginal inhabitants of the Philippines. They were found across Luzon before the Malayo-Polynesians migrated in and assimilated them. The Kingdom of Maynila flourished during the latter half of the Ming Dynasty as a result of direct trade relations with China. Ancient Tondo was maintained as the traditional capital of the empire, with its rulers as sovereign kings and not mere chieftains, and were addressed variously as panginuan ln Meranau or panginoón in Tagalog ("lords"); anák banwa ("son of heaven"); or lakandula ("lord of the palace"), the Emperor of China considered the Lakans (rulers of ancient Manila) "王" (Kings). In the 13th century, the city consisted of a fortified settlement and trading quarter at the shores of the Pasig River, on top of previous older towns. Manila was then invaded by the Indianized empire of Majapahit as referenced in the epic eulogy poem Nagarakretagama which inscribed its conquest by Maharaja Hayam Wuruk. Selurong "षेलुरोन्ग्" which is a historical name for the city of Manila is listed in Canto 14 alongside Sulot, which is now Sulu, and Kalka. During the reign of Sultan Bolkiah from 1485 to 1521, the Bruneian Empire invaded, wanting to take advantage of Tondo's China trade by attacking its environs and establishing "كوتا سلودوڠ Kota Saludong" (Now Manila). They ruled under and gave yearly tribute to the Sultanate of Brunei as its satellite state. They established a new dynasty under the local leader who accepted Islam and became Rajah Salalila or Tariq Sulayman I. He also established a trading challenge to the already rich House of Lakan Dula in Tondo. Islam was further strengthened by the arrival of Muslim traders from the Arab-Indian area and Southeast Asia. Manila was temporarily besieged by the invasion of Chinese pirate-warlord Limahong (1574) before it became the seat of the colonial government of Spain. On June 24, 1571, Spanish conquistador Miguel López de Legazpi arrived from New Spain (now Mexico), and then exercised rule of the Spanish city of Manila as a territory of New Spain with the establishment of a city council in what today is the district of Intramuros. López de Legazpi had the local royalty executed or exiled, after the failure of the Tondo Conspiracy; a plot wherein an alliance between Japanese merchants, Luzon's Huangs with several Datus and Rajahs plus the Bruneian Empire would band together to execute the Spaniards and their Latin-American mercenaries, and Visayan allies. At the conclusion of which, the victorious Spaniards made Manila the capital of the Spanish East Indies and of the Philippines, which the empire would control for the next three centuries, from 1565 to 1898. Manila then became famous during the Manila-Acapulco Galleon trade which lasted for three centuries and brought goods from Europe, Africa and Latin America across the Pacific Islands to Southeast Asia (Which was already an entrepot for goods coming from India, Indonesia and China) and trade also flowed vice versa. Silver that was mined in Mexico and Peru were exchanged for Chinese silk, Indian gems, and the spices of the Southeast Asia, some of which even flowed to Europe. Likewise wines and olives grown from Europe and North Africa were transshipped via Mexico towards Manila. The city was occupied by Great Britain for two years, from 1762 to 1764, as part of the European Seven Years' War between Spain and France and Great Britain. The city remained the capital of the Philippines under the government of the provisional British governor, Dawsonne Drake, acting through the Mexico-born Archbishop of Manila, Manuel Rojo del Río y Vieyra and the captive Audiencia Real. However, armed resistance to the British persisted, centered in Pampanga, and was led by Oidor Don Simón de Anda y Salazar. During the course of the occupation, the captive Hashemite Sultan of Sulu, Azim ud-Din I, was used as a hostage by both the British and Spanish. Also, the Chinese at Binondo rebelled against Spain and afterwards, the British's Sepoy mercenaries from India, mutinied against them. Eventually, the British withdrew as per agreements in the Treaty of Paris (1763). The Sepoys however, elected to stay and they settled in the area around Cainta, Rizal. As for the Chinese, thereafter, the fortress-city of Intramuros (Populated mostly by Europe-born colonists) always pointed their cannons against Binondo (The world's oldest Chinatown) to create a quick response against any more Chinese uprisings. After the British occupation, direct trade and communications with Spain was facilitated by the opening of the Suez Canal, supplanted indirect rule via the Viceroyalty. Eventually, Mexican Independence in 1821 necessitated direct rule from Spain. Under direct Spanish rule, banking, industry and education flourished more than in the past two centuries. The growing wealth and education attracted Indian, Chinese, Latino, European, and local migrants from the Philippine provinces to Manila, all of whom elected a nascent Filipino nationality regardless of ethnicity. The developments also facilitated the rise of an illustrado class which espoused liberal ideas, the ideological foundations of the Philippine Revolution which sought independence from Spain. 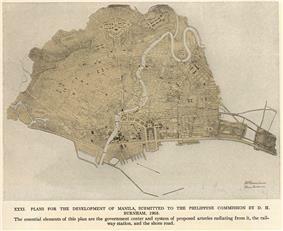 The Burnham Plan of Manila. North is at the left. After the Battle of Manila (1898), Spain ceded the surrendered city of Manila to the United States. The First Philippine Republic based at nearby Bulacan fought against the Americans for control of the city of Manila. The Americans defeated the First Philippine Republic and captured president Emilio Aguinaldo who announced allegiance to the United States on April 1, 1901. Upon drafting a new charter for Manila in June 1901, the Americans made official what had long been tacit: that the City of Manila was not Intramuros alone but also all its arrabales. 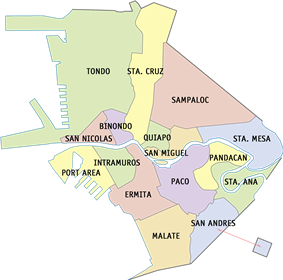 The new city charter proclaimed that Manila was composed of eleven municipal districts—presumably Tondo, Binondo, Santa Cruz, Sampaloc, San Miguel, Pandacan, Santa Ana, Paco, Malate, Ermita and Intramuros. In addition to these, the Church recognized five parishes as Manileno—namely, Gagalangin, Trozo, Balic-Balic, Santa Mesa and Singalong. Later times would add two more: Balut and San Andres Bukid. Under American control, a new civilian oriented Insular Government headed by then Governor-General William Howard Taft invited city planner Daniel Burnham for the transformation of Manila, to adapt the old city to changed times and modern needs. The Burnham Plan included development of the road system, the use of waterways for transportation, and beautification of Manila with the improvement of waterfronts, construction of parks, parkways and various building for various activities. The latter included a government center occupying all of Wallace Field, which extends from Luneta to the present Taft Avenue. The Philippine Capitol was to rise at the Taft Avenue end of the field, facing toward the sea, and would form, with the buildings of different government bureaus and departments, a quadrangle, lagoon in the center, and a monument to José Rizal at its Luneta end. Of Burnham's proposed government center, only three units — the Legislative Building and the building of the Finance and Agricultural departments — were completed when World War II erupted. Manila was also the site of the bloodiest battle in the Pacific theater during the Second World War. After falling to the Empire of Japan on January 2, 1942, it was recaptured by joint American and Filipino troops from February 3 to March 3, 1945. Some 100,000 civilians were killed in Manila in February 1945. 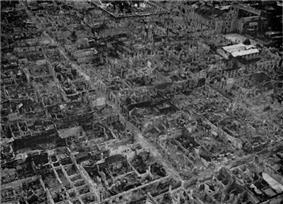 It was the second most devastated city in the world after Warsaw during the Second World War. 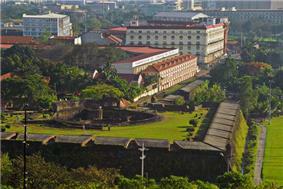 At the end of World War II, almost all of the structures in the city, particularly Intramuros, were destroyed but after the war, reconstruction took place. In 1948, President Elpidio Quirino moved the seat of government of the Philippines to Quezon City, a new capital city in the suburbs and fields northeast of Manila, created in 1938 by former President Manuel L. Quezon, which was named after him. The move ended any implementation of the Burnham Plan's intent for the government centre to be at Luneta. With the Visayan-born Arsenio Lacson as its first elected mayor in 1952 (all mayors were appointed prior to this), Manila underwent The Golden Age, once again earning its status as the "Pearl of the Orient", a moniker it earned before the Second World War. After Lacson's term in the 1950s, the city was led by Antonio Villegas during most of the 1960s, and Ramon Bagatsing (an Indian-Filipino) for nearly the entire decade of the 1970s until the 1986 People Power Revolution, making him the longest serving Mayor of Manila. Mayors Lacson, Villegas, and Bagatsing are often collectively considered as the "Big Three of Manila" less for their rather long tenures as the city's chief executive (continuously for over three decades, from 1952–1986), but more for their indelible contribution to the development and progress of the city and their lasting legacy in uplifting the quality of life and welfare of the people of Manila. During the administration of President Ferdinand Marcos, the region of the Metro Manila was created as an integrated unit with the enactment of Presidential Decree No. 824 on November 7, 1975. The area encompassed four cities and thirteen adjoining towns, as a separate regional unit of government. On the 405th anniversary of the city's foundation on June 24, 1976, Manila was reinstated by Marcos as the capital of the Philippines for its historical significance as the seat of government since the Spanish Period. Presidential Decree No. 940 states that Manila has always been to the Filipino people and in the eyes of the world, the premier city of the Philippines being the center of trade, commerce, education and culture. During the martial law era, Manila became a hot-bed of resistance activity as youths and student demonstrators repeatedly clashed with the police and military which were subservient to the regime. However, only after decades of resistance, did the non-violent People Power Revolution (predecessor of the peaceful-revolutions that fell the iron-curtain in Europe), finally ousted the Authoritarian Marcos from power. In 1992, Alfredo Lim was elected mayor, the first Chinese-Filipino to hold the office. He was known for his anti-crime crusades. Lim was succeeded by Lito Atienza, who served as his vice-mayor. Atienza was known for his campaign (and city slogan) "Buhayin ang Maynila" (Revive Manila), which saw the establishment of several parks and the repair and rehabilitation of the city's deteriorating facilities. He was the city's mayor for 3 terms (9 years) before being termed out of office. Alfredo Lim once again ran for mayor and defeated Atienza's son Ali in the 2007 city election and immediately reversed all of Atienza's projects claiming Atienza's projects made little contribution to the improvements of the city. The relationship of both parties turned bitter, with the two pitting again during the 2010 city elections in which Lim won against Atienza. During his term, Lim was sued by councilor Dennis Alcoreza on 2008 over human rights, charged with graft over the rehabilitation of public schools, and was heavily criticized for his haphazard resolution of the Rizal Park hostage taking incident, one of the deadliest hostage crisis in the Philippines. Later on, Vice Mayor Isko Moreno and 28 city councilors filed another case against Lim in 2012, stating that Lim's statement in a meeting were "life-threatening" to them. On the 2013 elections, former President Joseph Estrada defeated Lim in the mayoral race. The Pasig River and the Manila Central Post Office. Map of Manila and its landmarks. Manila is located on the eastern shores of Manila bay, which rests on the western shores of Luzon. The city lies 800 miles (1,300 kilometers) from mainland Asia. The Pasig River bisects the city. Almost all of Manila sits on top of centuries of prehistoric alluvial deposits built by the waters of the Pasig and on some land reclaimed from Manila Bay. The city's land has been altered substantially by human intervention, with considerable land reclamation along the waterfronts since the American colonial times. Some of the natural variations in topography have been evened out due to the urbanization of the city. As of 2007, the city has a land area of 24.98 square kilometres (9.64 sq mi) and has a total area of 38.55 square kilometres (14.88 sq mi). 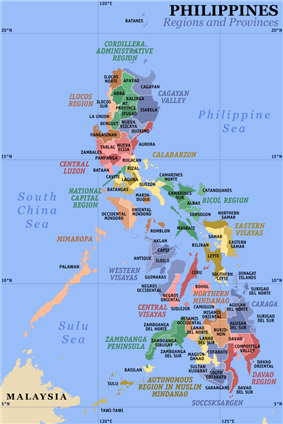 Manila sits astride the Pacific typhoon belt and is criss-crossed by several fault lines. This led to Manila and its metropolitan region to be ranked as the second riskiest capital (city) to live in according to Swiss Re. The seismically active Marikina Valley Fault System poses a threat to Manila and the surrounding regions. Manila endured several deadly earthquakes, notably in 1645 and in 1677 which destroyed the stone and brick medieval city. The Earthquake Baroque style was used by the Colonial architects during the Spanish colonial period in order to adapt to the frequent earthquakes. Under the Köppen climate classification system, Manila features a tropical savanna climate (Köppen climate classification Aw). Together with the rest of the Philippines, Manila lies entirely within the tropics. Its proximity to the equator means that the temperature range is very small, rarely going below 20 °C (68 °F) or above 38 °C (100 °F). Temperature extremes have ranged from 14.5 °C (58.1 °F) on January 11, 1914 to 38.6 °C (101.5 °F) on May 7, 1915. Humidity levels are usually very high all year round. Manila has a distinct dry season from December through May, and a relatively lengthy wet season that covers the remaining period with slightly cooler temperatures. In the rainy season it rarely rains all day but the rainfall is very heavy during short periods. Typhoons usually occur from June to September. Largely due to industrial waste and heavy reliance on automobiles, Manila suffers from air pollution in the form of smog which affects 98% of its populace. Air pollution causes more than 4,000 deaths per year. Ermita is the city's most air polluted place. Open dump sites and industrial waste contribute to increasing pollution in Manila. The Pasig River, where 150 tons of domestic waste and 75 tons of industrial waste were dumped daily according to a report in 2003, is one of the most polluted rivers in the world. Manila is affected by as many as 6 or 7 typhoons every year that creates constant flooding. In the aftermath of Typhoon Ketsana, lack of infrastructure which could avert future disasters was cited as one of the causes of flooding and pollution in the city. In order to adapt, the city has resorted to dredging its rivers and improving its drainage network. The Pasig River Rehabilitation Commission is in charge of cleaning up the Pasig River and its tributaries for transportation, recreation and tourism purposes. Because of rehabilitation efforts, several waterways in Manila are now cleaned-up and already lined with trees, plants and flowers instead of slums, which are now relocated in other areas. The bay skyline of Manila as seen from Harbour Square. The façade of the Natividad Building. The façade of the Manila Metropolitan Theater. Manila has architecturally significant buildings in a wide range of styles spanning distinct historical and cultural periods. Architectural styles reflect American, Spanish, Chinese, and Malay influences. Architects such as Antonio Toledo and Juan M. Arellano designed some significant buildings in Manila. Works of Arellano includes the Manila Metropolitan Theater and the Manila Central Post Office Buildings, while Antonio Toledo designed the Manila City Hall. 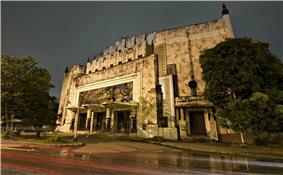 Some of the Art Deco theaters of Manila are designed by National Artists Juan Nakpil and Pablo Antonio. The historic Escolta Street in Binondo features many buildings of neo-classical and beaux-arts architectural style, some of which were designed by prominent Filipino architects in the 1920s to the late 1930s. At present, many architects, artists, historians and heritage advocacy groups are pushing for the revival of Escolta Street, which was once the premier street of the Philippines. Since Manila is prone to earthquakes, the Spanish colonial architects invented the style called Earthquake Baroque which the churches and government buildings during the Spanish colonial period adopted. As a result, succeeding earthquakes of the 18th and 19th centuries barely affected Manila, although it did periodically level the surrounding area. Modern buildings in and around Manila are designed or have retrofitted to withstand an 8.2 magnitude quake in accordance to the country's building code. The city of Manila is divided into sixteen officially defined administrative districts. These districts are subdivided into 897 barangays that are only known by sequential numbers instead of names. The districts only exist for administrative convenience and do not have their own sets of elected officials. Each geographical district is further divided into officially defined "zones," which are clusters of two or more barangays. Map of Manila and its districts. The headquarters of the Philippine Coast Guard is located at the South Harbor in Port Area near Intramuros and Ermita. The Philippine Navy on the other hand has its headquarters in Naval Station Jose Andrada located along Roxas Boulevard in Malate. Furthermore, the AFP Joint Task Force-National Capital Region was created in 2012 to ensure peace and stability in Metro Manila, of which Manila is a part. It bears the same functions of the deactivated National Capital Regional Command, although it operates on a much smaller size than its predecessor. At Harbour Square, where people go fish baiting. As of the 2010 census, the population of the city was 1,652,171 making it the second most populous city in the Philippines. Manila is the most densely populated city in the world with 43,079 inhabitants per km2. District 6 is listed as being the most dense with 68,266 inhabitants per km2, followed by District 1 with 64,936 and District 2 with 64,710, respectively. District 5 is the least densely populated area with 19,235. The vernacular language is Filipino, based mostly on the Tagalog of surrounding areas, and this Manila form of speaking Tagalog has essentially become the lingua franca of the Philippines, having spread throughout the archipelago through mass media and entertainment. Meanwhile, English is the language most widely used in education, business, and heavily in everyday usage throughout the Metro Manila region and the Philippines itself. A number of older residents can still speak basic Spanish, which used to be a mandatory subject in the curriculum of Philippine universities and colleges, and many children of Japanese Filipino, Indian Filipino, and other migrants or expatriates also speak their parents' languages at home, aside from English and/or Filipino for everyday use. Minnan Chinese (known as Lannang-oe) is spoken by the city's Chinese-Filipino community. The Filipino-Chinese Friendship Arch in Binondo, the oldest Chinatown in the world. The city is a major center for banking and finance, retailing, transportation, tourism, real estate, new media as well as traditional media, advertising, legal services, accountancy, insurance, theater, fashion, and the arts in the Philippines. Manila ranks 3rd in terms of economic dynamism in the Philippines and its economy size ranks as the 5th largest according to the Cities and Municipalities Competitiveness Index. The CMCI is published by the National Competitiveness Council of the Philippines. The Port of Manila is the largest seaport in the Philippines, making it the premier international shipping gateway to the country. The Philippine Ports Authority is government agency responsible to oversee the operation and management of the ports. The International Container Terminal Services Inc. cited by the Asian Development Bank as one of the top five major maritime terminal operators in the world has its headquarters and main operations on the ports of Manila. The Asian Terminal Incorporated, meanwhile has its corporate office and main operations in the Manila South Harbor and its container depository located in Santa Mesa. Port of Manila, the chief port of the Philippines. Binondo, the largest Chinatown in the world, was the center of commerce and business activities in the city. Numerous residential and office skyscrapers are found within its medieval streets. Plans to make the Chinatown area into a business process outsourcing (BPO) hub progresses and is aggressively pursued by the city government of Manila. 30 buildings are already identified to be converted into BPO offices. These buildings are mostly located along the Escolta Street of Binondo, which are all unoccupied and can be converted into offices. Near Binondo is Divisoria, a place in Manila dubbed as the shopping mecca of the Philippines. Clusters of shopping malls are found within this place, along with several small-scale stores that sells products and goods at bargain price. Divisoria's famous landmark is the Tutuban Center, a large shopping mall that is a part of the Philippine National Railways' Main Station. It attracts 1 million people every month, but is expected to add another 400,000 people when the LRT-2 West Extension is constructed, making it Manila's busiest transfer station. The Bangko Sentral ng Pilipinas, the central bank of the Philippines. The Pandacan Oil Depot houses the storage facilities and distribution terminals of the three major players in the country's petroleum industry, namely Caltex Philippines, Pilipinas Shell and Petron Corporation. The oil depot has been a subject of various concerns, including its environmental and health impact to the residents of Manila. The Supreme Court has ordered a decision for the oil depot to submit its relocation plans and is expected to be relocated outside the city by July 2015. Manila is a major publishing center in the Philippines. Manila Bulletin, the Philippines' largest broadsheet newspaper by circulation, is headquartered inside Intramuros. Other major publishing companies in the country like The Manila Times, The Philippine Star and Manila Standard Today are headquartered inside the Port Area. The Chinese Commercial News, the Philippines' oldest existing Chinese-language newspaper, and the country's third-oldest existing newspaper is headquartered in Binondo. Manila serves as the headquarters of the Central Bank of the Philippines which is located along Roxas Boulevard. Some universal banks in the Philippines that has its headquarters in the city are the Landbank of the Philippines and Philippine Trust Company. Philam Life Insurance Company, currently the largest life insurance company in the Philippines in terms of assets, net worth, investment and paid-up capital, has its headquarters along United Nations Avenue in Ermita. Unilever Philippines has its corporate office along United Nations Avenue in Paco. Toyota, a company listed in the Forbes Global 2000 also has its regional office along UN Avenue. Panorama of the National Theater at the Cultural Center of the Philippines. Tourism is a vital industry in Manila, and it welcomes approximately over 1 million tourists each year. Major destinations include the walled city of Intramuros, the National Theater at the Cultural Center of the Philippines,[note 1] Manila Ocean Park, Binondo, Ermita, Malate, Manila Zoo, National Museum of the Philippines and Rizal Park. 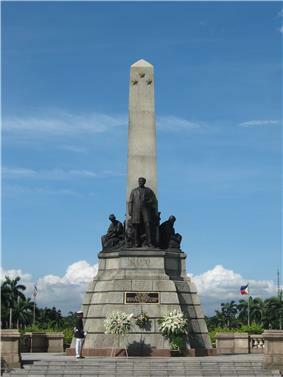 Rizal Park, also known as Luneta Park, is the national park of the country and has an area of 58 hectares (140 acres), making it the largest urban park in Asia. In the Tourism Act of 2009, Rizal Park along with Intramuros are designated as flagship destination to become a tourism enterprise zone. A new attraction called Paseo de Manila is expected to rise in the park. The park was constructed as an honor and dedication to the country's national hero José Rizal, who was executed by the Spaniards on charges of subversion. The flagpole west of the Rizal Monument is the Kilometer Zero marker for distances to the rest of the country. 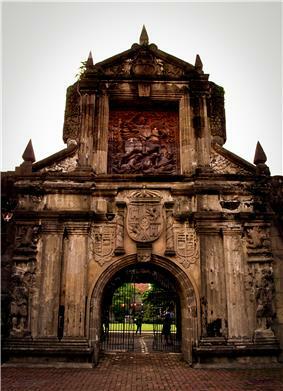 The arch gate of Fort Santiago. The Department of Tourism designates Manila as the pioneer of medical tourism, expecting it to generate $1 billion in revenue annually. However, lack of progressive health system, inadequate infrastructure and the unstable political environment are seen as hindrances for its growth. Tutuban Centermall, a famous shopping center for locals in the city. Manila is a well-known shopping hub of the country and it has been named as one of the best shopping destinations in Asia. Major shopping malls, markets and bazaars thrives in Manila. Robinsons Place Manila is the largest shopping mall in the city. The mall was the second and by-far, the largest Robinson Mall ever built by John Gokongwei. 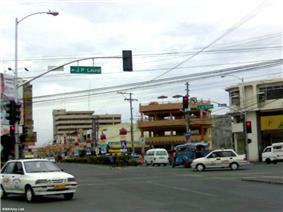 SM Supermall maintains presence in the city. One of their shopping mall is the SM City Manila, the first SM Supermall in the city featuring major SM brands like the The SM Store, SM Supermarket, SM Cinemas and SM Foodcourt. It is located right beside the Manila City Hall. SM City San Lazaro is the second SM Supermall in Manila. It is located in Santa Cruz. SM City San Lazaro was constructed on the site of the former San Lazaro Hippodrome. The building of the former Manila Royal Hotel in Quiapo which is famed for its revolving restaurant atop is now the SM Clearance Center which was established in 1972. The site of the first SM Store is located at Carlos Palanca Sr. (formerly Echague) Street in San Miguel. Quiapo is referred as the "Old Downtown" where tiangges, markets, botique shops, music and electronics stores are common. C.M. Recto Avenue is where lots of department stores are located. One of Recto Avenue's famous destination is Divisoria, home to numerous shopping malls in the city. It is also dubbed as the shopping mecca of the Philippines where everything is sold at bargain price. Binondo, the oldest Chinatown in the world, is the city's center of commerce and trade for all types of businesses run by Filipino-Chinese merchants with a wide variety of Chinese and Filipino shops and restaurants. The Minor Basilica of San Sebastián, the only all-steel church in Asia. San Agustín Church is a UNESCO World Heritage Site. 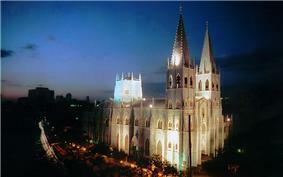 As a result of Spanish cultural influence, Manila is a predominantly Christian (Catholic) city. As of 2010, Roman Catholics comprises 93.5% of the population, followed by adherents of the Philippine Independent Church (2.4%); Iglesia ni Cristo (1.9%); various Protestant churches (1.8%); and Buddhists (1.1%). Members of other religions comprises the remaining 1.4% of the city's population. 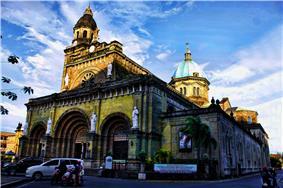 Manila is the site of prominent Catholic churches and institutions. The Manila Cathedral is the seat of the Roman Catholic Archdiocese of Manila and the oldest established church in the country. Aside from the Manila Cathedral, there are also three other basilicas in the city: Quiapo Church, Binondo Church, and the Minor Basilica of San Sebastián. The San Agustín Church in Intramuros is a UNESCO World Heritage Site and is one of the two fully air-conditioned Catholic churches in the city. Manila also has other parishes located throughout the city, with some of them dating back to the Spanish Colonial Period when the city serves as the base for numerous Catholic missions both within the Philippines and to Asia beyond. Several Mainline Protestant denominations are headquartered in the city. St Stephen's Parish pro-cathedral in the Sta. Cruz district is the see of the Episcopal Church in the Philippines' Diocese of Central Philippines, while align Taft Avenue are the main cathedral and central offices of the Iglesia Filipina Independiente (also called the Aglipayan Church, a national church that was a product of the Philippine Revolution). The indigenous Iglesia ni Cristo has several locales (akin to parishes) in the city, including its very first chapel (now a museum) in Punta, Sta. Ana. Evangelical, Pentecostal and Seventh-day Adventist denominations also thrives within the city. The headquarters of the Philippine Bible Society is in Manila. Also, the main campus of the Cathedral of Praise is located along Taft Avenue. Jesus Is Lord Church also has several branches and campuses in Manila, and celebrates its anniversary yearly at the Burnham Green and Quirino Grandstand in Rizal Park. Manila celebrates civic and national holidays. Manila Day, which celebrates the city's founding on June 24, 1571, was first proclaimed by patronage of John the Baptist. Locally, each of the city's barangays also have their own festivities guided by their own patron saint. The city is also the host to the Feast of the Black Nazarene, held every January 9, which draws millions of Catholic devotees. Another religious feasts held in Manila was the Feast of the Nuestra Señora de los Desamparados de Manila (Our Lady of the Abandoned), the patron saint of Santa Ana and was held every May 12. Non-religious holidays include the New Year's Day, National Heroes' Day, Bonifacio Day and Rizal Day. The National Art Gallery of the National Museum of the Philippines. As the cultural center of the Philippines, Manila is the home to a number of museums. The National Museum of the Philippines Complex, which include the Museum of the Filipino People and the Museum of Natural History, is located on the proposed new national government center during the American time. Museums established by educational institutions include the Mabini Shrine, the Museum of Contemporary Art and Design, UST Museum of Arts and Sciences, and the UP Museum of a History of Ideas. Sports in Manila have a long and distinguished history. 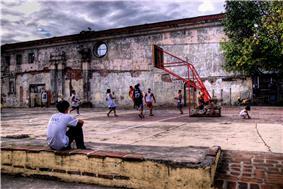 The city's, and in general the country's main sport is basketball, and most barangays have a makeshift basketball court, with court markings drawn on the streets. Larger barangays have covered courts where interbarangay leagues are held every summer (April to May). The city has several well-known sports venues, such as the Rizal Memorial Sports Complex and San Andres Gym, the home of the now defunct Manila Metrostars. The Rizal Memorial Sports Complex houses the Rizal Memorial Track and Football Stadium, the Baseball Stadium, Tennis Courts, Memorial Coliseum and the Ninoy Aquino Stadium (the latter two are indoor arenas). The Rizal complex had hosted several multi-sport events, such as the 1954 Asian Games and the 1934 Far Eastern Games. Whenever the country hosts the Southeast Asian Games, most of the events are held at the complex, but in the 2005 Games, most events were held elsewhere. The 1960 ABC Championship and the 1973 ABC Championship, forerunners of the FIBA Asia Championship, was hosted by the complex, with the national basketball team winning on both tournaments. The 1978 FIBA World Championship was held at the complex although the latter stages were held in the Araneta Coliseum in Quezon City, Southeast Asia's largest indoor arena. Previously a widely played sport in the city, Manila is now the home of the only sizable baseball stadium in the country, at the Rizal Memorial Baseball Stadium. The stadium hosts games of Baseball Philippines; Lou Gehrig and Babe Ruth were the first players to score a home run at the stadium at their tour of the country on December 2, 1934. Another popular sport in the city are cue sports, and billiard halls are a feature in most barangays. The 2010 World Cup of Pool was held at Robinsons Place Manila. The Rizal Memorial Track and Football Stadium hosted the first FIFA World Cup qualifier in decades when the Philippines hosted Sri Lanka in July 2011. The stadium, which was previously unfit for international matches, had undergone a major renovation program prior to the match. The Football Stadium now regularly hosts matches of the United Football League. The stadium also hosted its first rugby test when it hosted the 2012 Asian Five Nations Division I tournaments. The Manila City Hall houses the offices of the mayor and council of Manila. The government of Manila is divided into three branches: executive, legislative and judiciary. 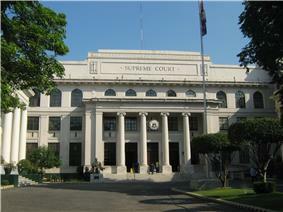 The judicial branch is administered solely by the Supreme Court of the Philippines under the Metro Manila judicial region. The city government have control of the executive and legislative branch. Manila employs 11,919 personnel at the end of 2014. The Mayor of Manila is the head of the executive and legislative branch, who is assisted by the Manila City Council which is composed of six elected city councilors, the local President of the Association of Barangay Captains, and the President of the Sangguniang Kabataan. 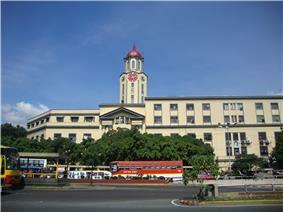 The office of the Mayor and the City Council is located at the Manila City Hall. The current mayor of the city is Joseph Estrada, former President of the Philippines, who defeated former mayor Alfredo Lim in the 2013 local election. Isko Moreno is the city's current vice mayor. On September 25, 2014, the Commission on Audit released its 2013 Annual Financial Report citing the city's income at ₱10.1 billion with an asset worth of ₱18.6 billion. Its local income stood at ₱5.41 billion and its national government allocation was ₱1.74 billion, having an annual regular income (ARI) of an estimated ₱7.15 billion. Manila's net income stood at ₱3.54 billion in 2014. Among the local government units, Manila has the highest budget allocation to health. It was also one of the cities with the highest tax and internal revenue. Tax revenue accounts for 46% of the city's income in 2012. Manila has six legislative districts that serve as the constituencies for the election of the city's representatives to the lower house of the Congress of the Philippines and of the regular members to the Sangguniang Panlungsod (SP; City Council). Each district elects one representative to the House of Representatives and six SP members to the council. 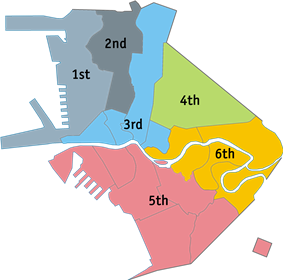 The city, along with the rest of the nation, elects 12 senators as one at-large district. Manila is politically divided into 896 barangays, the smallest unit of local government in the Philippines. Each barangay has its own chairperson and councilors. For administrative convenience, all the barangays in Manila are grouped into 100 zones. These zones have no form of local government. The 1st District (2007 population: 407,331) is Manila's (and the country's) most densely populated congressional district. 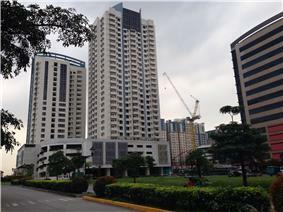 It covers the western portion of Tondo that lies along Manila Bay. The 2nd District (2007 population: 223,273) covers the eastern inland portion of Tondo, a neighborhood or sub-district known as Gagalangin. The 3rd District (2007 population: 197,242) covers Binondo, Quiapo, San Nicolas and Santa Cruz. The 4th District (2007 population: 255,613) covers Sampaloc. The 5th District (2007 population: 315,961) covers Ermita, Malate, Port Area, Intramuros, San Andres Bukid, and a portion of Paco (except Zone 90). The 6th District (2007 population: 261,294) covers Paco (Zone 90 only), Pandacan, San Miguel, Santa Ana and Santa Mesa. Manila, being the seat of political power of the Philippines, has several national government offices headquartered at the city. 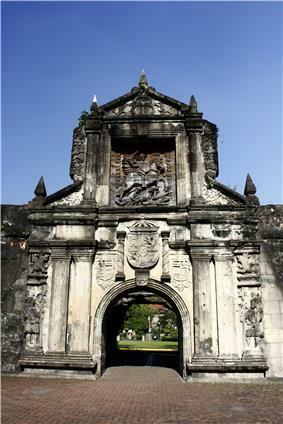 Planning for the development for being the center of government started during the early years of American colonization to the country when they envisioned a well-designed city outside the walls of Intramuros. The strategic location chosen was Bagumbayan, a former town which is now the Rizal Park to become the center of government and a design commission was given to Daniel Burnham to create a master plan for the city patterned after Washington D.C.. These improvements were eventually abandoned under the Commonwealth Government of Manuel L. Quezon. The city, as the capital, still hosts the Office of the President, as well as the president's official residence. Aside from these, important institutions such as the Supreme Court, the Court of Appeals, the Bangko Sentral ng Pilipinas, the Departments of Budget and Management, Finance, Health, Justice, Labor and Employment and Public Works and Highways still call the city home. Manila also hosts important national institutions such as the National Library, National Archives, National Museum and the Philippine General Hospital. Congress previously held office at the Old Congress Building. In 1972, due to declaration of martial law, Congress was dissolved; its successor, the unicameral Batasang Pambansa, held office at the new Batasang Pambansa Complex. 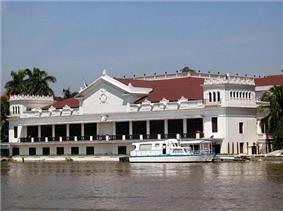 When a new constitution restored the bicameral Congress, the House of Representatives stayed at the Batasang Pambansa Complex, while the Senate remained at the Old Congress Building. In May 1997, the Senate transferred to a new building it shares with the Government Service Insurance System at reclaimed land at Pasay. Water services are formerly provided by the Metropolitan Waterworks and Sewerage System, which serves 30% of the city with most other sewage being directly dumped into storm drains, septic tanks, or open canals. MWSS was privatized in 1997 which splits the water concession into the east and west zones. The Maynilad Water Services took over the west zone of which Manila is a part. It now provides the supply and delivery of potable water and sewerage system in Manila, but it does not provide service to the southeastern part of the city which belongs to the east zone that is served by Manila Water. Electric services are provided by Meralco, the sole electric power distributor in Metro Manila. 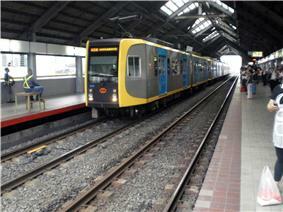 Train at Blumentritt Station of the Manila Light Rail Transit System Line 1. One of the more famous modes of transportation in Manila is the jeepney. Patterned after U.S. army jeeps, these have been in use since the years immediately following World War II. Today, the Tamaraw FX, the third generation Toyota Kijang, has begun to compete directly with jeepneys. Along with buses, jeepneys and Tamaraws follow fixed routes for a set price. On a for-hire basis, the city is served by numerous taxicabs, "tricycles" (motorcycles with sidecars, the Philippine version of the auto rickshaw), and "trisikads" or "sikads" (bicycles with a sidecars, the Philippine version of pedicabs). In some areas, especially in Divisoria, motorized pedicabs are popular. Spanish-era horse-drawn calesas are still a popular tourist attraction and mode of transportation in the streets of Binondo and Intramuros. All types of public transport are privately owned and operated under government franchise. The city is serviced by the LRT-1 and LRT-2 which forms the LRTA system, as distinct from the MRT-3 which is under the MRTC system that services other parts of Metro Manila. Development of the railway system began in the 1970s under the Marcos administration, making it the first light rail transport in Southeast Asia. These systems are currently undergoing a multibillion-dollar expansion. LRT Line 1 runs along the length of Taft Avenue (R-2) and Rizal Avenue (R-9), and the LRT Line 2 runs along Claro M. Recto Avenue (C-1) and Ramon Magsaysay Boulevard (R-6) from Santa Cruz, through Quezon City, up to Santolan in Marikina. The main terminal of the Philippine National Railways lies within the city. One commuter railway within Metro Manila is in operation. The line runs in a general north-south direction from Tutuban (Tondo) toward Laguna. The Port of Manila, located in the vicinity of Manila Bay is the chief seaport of the Philippines. 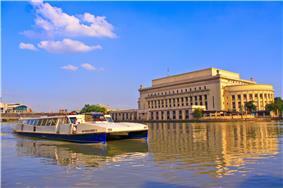 The Pasig River Ferry Service which runs on the Pasig River is another form of transportation. The city is also served by the Ninoy Aquino International Airport and Clark International Airport. In 2006, Forbes magazine ranked Manila "the world's most congested city". Manila has become notorious for its frequent traffic jams and high densities. The government has undertaken several projects to alleviate the traffic in the city. Some of the projects include: the construction of a new flyover at Sampaloc, the construction of the Metro Manila Skyway Stage 3, the proposed LRT Line 2 (west) extension from Recto to Tondo or the Port Area, and the expansion of several national and local roads. However, such projects have yet to make any meaningful impact, and the traffic jams and congestion continue unabated. The urban planning of the Manila and the whole metropolis was based on the Metro Manila Dream Plan. It was commenced to address Metro Manila's urban planning and transportation. It consists of a list of short term priority projects and medium to long term projects lasting up to 2030. The Manila Health Department is responsible for the planning and implementation of the health care programs provided by the city government. It operates 49 health centers and lying-in clinic. Manila boasts of six city-run hospitals. The six hospitals are: the University of the City of Manila affiliate Ospital ng Maynila Medical Center, Ospital ng Tondo Medical Center, Ospital ng Sampaloc Medical Center, Gat. Andres Bonifacio Memorial Medical Center, Santa Ana Hospital, and the Justice Jose Abad Santos General Hospital. Manila is also the site of the Philippine General Hospital, the flagship hospital of the country affiliated with the University of the Philippines Manila. Manila's healthcare is also provided by private corporations. Among the well-known private hospitals in the city are the Manila Doctors Hospital, Chinese General Hospital and Medical Center, Dr. José R. Reyes Memorial Medical Center, Metropolitan Medical Center, Our Lady of Lourdes Hospital, and the University of Santo Tomas Hospital. The World Health Organization Country Office for the Philippines. The campus of the University of the City of Manila. The center of education since the colonial period, Manila — particularly Intramuros — is home to several Philippine universities and colleges as well as its oldest ones. It served as the home of the University of Santo Tomas (1611), Colegio de San Juan de Letran (1620), and Ateneo de Manila University (1859). Only Colegio de San Juan de Letran (1620) remains at Intramuros; the University of Santo Tomas transferred to a new campus at Sampaloc in 1927, and Ateneo left Intramuros for Loyola Heights, Quezon City (while still retaining "de Manila" in its name) in 1952. The University of the City of Manila (Pamantasan ng Lungsod ng Maynila) located at Intramuros, and Universidad de Manila located just outside the walled city, are both owned and operated by the Manila city government. The national government controls the University of the Philippines Manila, the oldest of the University of the Philippines constituent universities and the center of health sciences education in the country. The city is also the site of the Polytechnic University of the Philippines, the largest university in the country in terms of student population. ^ Mijares, Armand Salvador B. (2006). .The Early Austronesian Migration To Luzon: Perspectives From The Peñablanca Cave Sites. Bulletin of the Indo-Pacific Prehistory Association 26: 72–78. ^ a b Raitisoja, Geni " Chinatown Manila: Oldest in the world", Tradio86.com, July 8, 2006, accessed March 19, 2011. ^ "Milestone in History". Quezon City Official Website. Retrieved April 22, 2013. ^ "Fire and Quake in the construction of old Manila". The Frequency of Earthquakes in Manila. Retrieved November 22, 2013. ^ "A dying river comes back to life" - Santelices, Menchit. Philippine Information Agency.